It was a huge weekend for Vail Valley ski racers as athletes like Mikaela Shiffrin, River Radamus and Paula Cooper collected podium positions and wins in races from Switzerland to Norway. The Shiffrin, Radamus, Cooper combo collected three golds and a silver in three four separate events over the weekend and on Monday. Eagle-Vail’s Shiffrin completed an incredible comeback from a knee injury just two months ago in Sweden, winning a makeup World Cup slalom Monday in Crans-Montana, Switzerland by nearly a half a second over Nastasia Noens of France and Marie-Michele Gagnon of Canada. At the Olympic Youth Winter Games in Lillehammer, Norway, River Radamus, of Edwards, doubled up on Sunday, grabbing his second gold medal of the Games in the alpine combined. Vail’s Paula Cooper, also a Ski and Snowboard Club Vail athlete, took home the silver medal in free-skiing halfpipe on Sunday. Cooper, who has scored a handful of podium finishes on the Revolution Tour, was flanked on the podium by Madison Rowlands of Great Britain in first and Lara Wolf of Austria in third. Fresh off his super-G victory Saturday, Radamus grabbed gold in the combined super-G/slalom event on Sunday by 0.07 seconds over Austria’s Manuel Traninger. Radamus won the morning super-G by 0.89 seconds over Italy’s Michael Tedde, who eventually finished 10th. However, a slight mistake near the finish of the slalom almost cost him a shot at the gold. Radamus, who commended the race crew for providing a perfect course for Sunday’s race, is scheduled to compete in Wednesday’s giant slalom and Thursday’s slalom events. But despite the pressure of already winning two races, he is excited just to soak up the experience. On the World Cup circuit, Vail’s Lindsey Vonn wasn’t able to compete in any of the speed events Saturday and Sunday in Crans-Montana after heavy snow moved in and scrapped both of those races. But Eagle-Vail’s Shiffrin stepped up nicely in the slalom on Monday. It was Shiffrin’s first race back after partially tearing her MCL and deeply bruising her right knee in a training crash in Are, Sweden, in December. The slalom gold medalist and two-time world slalom champion just started training on skis again only two weeks ago at Beaver Creek and Loveland. It was Shiffrin’s third slalom win this season after winning two slalom races in Aspen in November and her 18th career World Cup win, equaling former U.S. Ski Team member Tamera McKinney’s World Cup total. She is now tied for second among U.S. Ski Team women behind Vonn, who has a women’s record 76 World Cup wins. “I was really nervous for the first run,” Shiffrin said. “So nervous that I thought I left my legs at the start. But the second run was better, I felt like I was back in the groove. Up next, the women’s tour moves to La Thuile, Italy for two downhill races – including a make-up from Crans-Montana – and a super-G race Feb. 20-21, then to Soldeu-El Tarter, Andorra for super-G and alpine combined events Feb. 27-28. 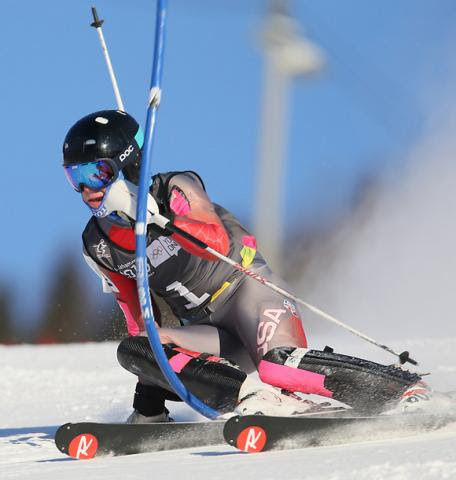 Jasna, Slovakia will then host giant slalom and slalom events on March 5-6.